It’s easy to be desensitized as a defense against hype; all around us we are being sold, told that something is the biggest, the best, the newest. Folding our arms and saying, “Oh, yeah? Prove it!” isn’t just reflexive cynicism, it’s practically a self-defense mechanism, the only way to protect ourselves against the barrage of pitches clamoring for our attention. Arts advocacy, sadly, isn’t immune to hyperbole, and even well-meaning statements like Mr. Holland’s Opus and The Mozart Effect can overstate their cases, ringing hollow. I’m as guilty as anyone else: music can be a powerful experience, and difficult to put into words. If we sometimes go overboard when speaking on its behalf, it’s because we have been transported, and words are rarely big enough to explain it. Kerry Candaele (the director of Wal-Mart: The High Cost of Low Price and other documentaries) described himself in his 20s as full of “angst, existential dread, and spiritual maladies,” before his discovery of the music of Ludwig van Beethoven, specifically a cassette recording of Beethoven’s Ninth Symphony. The music touched him so deeply that he became a convert, digging into Beethoven’s music and wanting to pound on people’s doors, asking them, “Do you have Beethoven in your life?” Fortunately, instead of doing that, Candaele wrote and directed Following the Ninth, which takes a different tack (I caught the film at the Wichita Orpheum Theatre Wednesday night, co-presented by the Tallgrass Film Association and Wichita Symphony Orchestra). 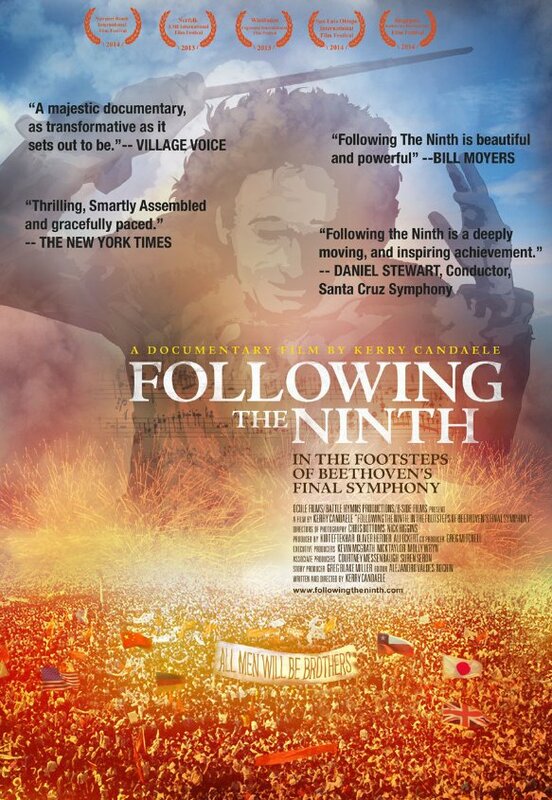 Before Wednesday night’s screening of Following the Ninth, Candaele spoke briefly to those brought to the screening “not under their own free will,” seeking to allay their fears by stating up front that his film is not a biopic, and not an academic analysis of the music. Indeed, as the film proceeded there were relatively few pronouncements from musical experts and almost no references to Beethoven’s biography, other than the fact that by the time he composed the Ninth (his last completed symphony) in 1824, he was completely deaf. The film focuses squarely on individuals from China, Japan, Chile, and Germany, speaking in their own words (and with the support of copious historical and newly-filmed footage) about what the Ninth Symphony has meant to them. Candaele makes his case for the power of art by example. Following the Ninth celebrates the communal nature of Beethoven’s masterpiece, concentrating on times and places in which the complete work (especially the famous “Ode to Joy” of the last movement) gave solace or energy to people desperate for freedom, equality, brother- and sisterhood. In 1989, mere months apart, demonstrators in Tiananmen Square and crowds celebrating the dismantling of the Berlin Wall adopted the Ninth as anthems under very different circumstances: the Chinese student demonstrators, represented by student leader Feng Congde, hijacked public PA systems and blared the Ninth Symphony to drown out official announcements and threats; in East Berlin, Lene Ford grew up being forced to sing Beethoven’s work in school, taught only that he was a “social revolutionary.” After the collapse of the Wall (only two months after Lene’s brother had been shot trying to escape to the West! ), the Ode to Joy symbolized a moment of sudden openness: for a young woman who had been spied upon by the Stasi simply because she had pen pals in other countries, “who were like fiction to me, because I knew I would never see them,” the experience of freedom was overpowering. While the Chinese student demonstrations would be crushed by government force, and East Germany would be reunited with the West as the Soviet system crumbled, both Feng and Ford speak to the transformation they underwent during those events: the sense that they could do anything, that both they and the world had changed. Ford comments that the feelings she experienced, and the welcome she received from West Germans the first day the border was opened, have stayed with her, forming a reserve of strength she has drawn on throughout her life since then. At a concert after the Wall fell, conductor Leonard Bernstein famously changed a single word in the Ode from freude (joy) to freiheit (freedom)–a change not without some controversy; while both words were appropriate for the moment, it is the sense of utter joy that comes through as Ford recounts her story. As for Feng, when he describes the plaster statue of a woman holding a torch aloft that the students erected in Tiananmen Square–an iconic image that was interpreted as a Chinese Statue of Liberty in the U. S.–he refers to her as Joy personified. when the lives of individuals and communities are controlled by powers that themselves remain uncontrolled–slavers, czars, führers, first secretaries, marshals, generals and generalissimos, ideologists of dictatorships at either end of the spectrum–then creative energy becomes a protest. . . . Totalitarian ideologists don’t like real life (other people’s) because it cannot be totally controlled; they loathe art, the product of a yearning for life, because that too evades control. Some of the most harrowing passages in the film describe the paranoia and secrecy that marked Pinochet’s Chile, as suspected dissidents were “disappeared,” rounded up by the government for torture and (sometimes) execution. Indeed, many of the public protests against Pinochet were led by women: so many of the men had been taken that the women left behind became the public voices of dissent, keeping the names and faces of the “disappeared” in the public eye and leading non-violent demonstrations (including singing the forbidden “Himno”). Although Pinochet is gone, the recollections of the Chilean activists are bittersweet, with a sense of grievous loss that can only be processed through wry humor or simply by moving on. Unlike the examples of the Ode taking on heightened significance at moments of political crisis, the annual performance of Beethoven’s Ninth has been an established tradition in Japan since World War I: professional orchestras, schools, and Daiku (“great nine”) associations stage hundreds of performances of the symphony every year in December, where it is associated with the New Year, similar to choral societies in the West that perform Handel’s Messiah and other works annually. Candaele sits in on rehearsals with some of these groups, made up of amateurs who sing for both musical fulfillment and camaraderie; as in the West, Daiku choruses are civic and social as well as artistic in function, with a great emphasis placed on the value of cooperative endeavors. Following the Ninth was six years in the making; at the outset of filming, Candaele could not have expected the horrific earthquake and tsunami that devastated parts of Japan in March 2011; but in the aftermath, Beethoven’s Daiku was an obvious symbol for the Japanese people to express their resilience and solidarity. Following the Ninth is not a straight concert film, but it does roughly follow the order of Beethoven’s symphony, with the Ode to Joy as a recurring touchstone, introduced at the very beginning and referred to throughout the film (whereas in the symphony it is heard only in the final movement). The four countries’ stories are intertwined, cutting back and forth, leaning on the similarities more than the differences (after all, the theme of the Ode is universal brotherhood). Beethoven’s music is frequently heard in the background under dialogue or in tandem with footage of crucial events, but longer passages are also played over montages of images cut to match the rhythm of the music. It’s in these sections that Following the Ninth comes closest to being outright manipulative: scenes of children playing, people marching, and breathtaking natural vistas are like cinematic candy–tasty but not very nutritious–and Beethoven’s music doesn’t need the extra juice. Likewise, the scenes of goose-stepping German soldiers, Chinese tanks rolling over student encampments, and massive walls of water bearing down on the Japanese coast are chilling enough without Beethoven’s timpani or ominous harmonies making the point. Still, even those scenes contribute to the film’s theme: the unity of mankind in all its diversity, as optimistically celebrated by poet Friedrich Schiller in the Ode that Beethoven would set to music in his monumental symphony; and the ways in which Beethoven’s music has been adopted and given meaning in settings quite different from that which he experienced. Candaele opens the film with punk/folk singer Billy Bragg telling the story of the time he was invited to rewrite the words to Schiller’s Ode; like Bernstein’s change of a crucial word, that is sacrilege to some people, but it is similar to the way in which each person interviewed in the film has made Beethoven their own, and the way Candaele has used the symphony as a vehicle for telling their stories. I think that’s the reason so little of Beethoven’s specific history is included in Following the Ninth: it’s already well-known, sure, but more importantly it’s beside the point. For the Chilean and Chinese protesters, for the suddenly liberated East Germans, and for the Japanese coming together in the face of disaster, Beethoven’s music wasn’t history, or even a convenient symbol: it was alive and it was speaking to them in that moment. I suspect that’s what we really mean when we say a work of art is “timeless,” and it’s the reason it’s so difficult to put into words after the moment is over.